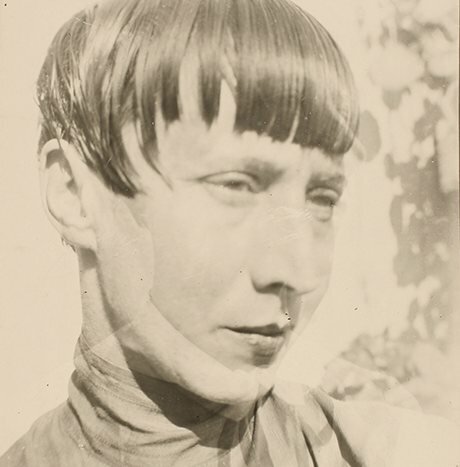 This essay on Hannah Höch appeared in the Guardian Review. The First International Dada Fair took place in Berlin in the summer of 1920, and included works by George Grosz, John Heartfield, Max Ernst and Francis Picabia. Photographs from the opening show the gallery teeming with paintings, posters and scurrilous assemblages; hanging from the ceiling is Prussian Archangel, by Heartfield and Rudolf Schlichter: a pig-faced dummy in military uniform. Suited and spatted, the dadaists comport themselves with dandyish indifference to their own anti-art inventions. 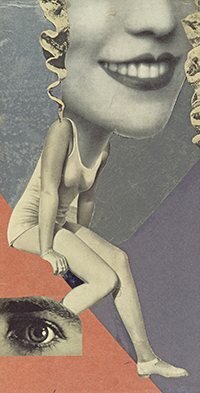 There are only two women present, and one of them is the bobbed and diminutive Hannah Höch, who leans playfully on a cane borrowed from Grosz while she looks over the shoulder of her lover, Raoul Hausmann. To the right of the couple is a pasted slogan: “Art is dead. Long live the machine art of Tatlin.” And to the left a large, squarish composition in which one can just about discern faces, text and fragments of machinery. The work in question is Höch’s photomontage Cut With the Kitchen Knife Dada Through the Last Weimar Beer-Belly Cultural Epoch of Germany. Judging by reviews of the time it was one of the hits of the fair, perhaps because it’s so richly legible in terms of contemporary cultural politics. Ranged in the top right corner are the forces of “anti-dada”: stern representatives of the late empire, the army and the new Weimar government. Below, in the dada corner, are massed artists, communists and other radicals. Raoul Hausmann is being extruded, shat out really, by a machine to which is affixed the head of Karl Marx. There are less crudely anatomical machines scattered about the metre-wide collage, and female film stars such as Pola Negri battle with moustached emissaries of the old German order. In the bottom right corner, Höch has glued a small map showing the European countries in which women could then vote. Cut With the Kitchen Knife is Höch’s best-known work, though it’s something of an anomaly – not least in its scale – and it does not appear in the Whitechapel Gallery’s new exhibition. Höch claimed she had hit on the technique of photomontage while on a Baltic holiday with the married Hausmann in 1918; having come across mocked-up photos sent home by German soldiers, in which the young men’s heads were superimposed on pictures of musketeers, they realised the power of cut-and-paste to “alienate” images. This origin tale is slightly misleading, however, because since 1916 Höch had been working for the Berlin publisher Ullstein, producing embroidery and lace designs for such periodicals as Die Dame and Die Praktische Berlinerin. 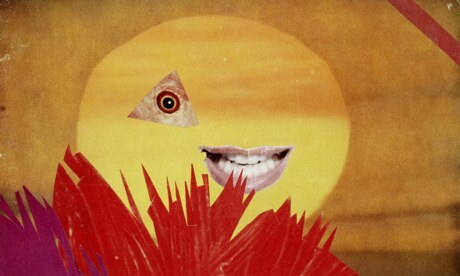 She was probably already familiar with the kinds of collage that an expanding print media practised with photographs. Höch worked on these handicraft magazines for a decade, and even wrote a manifesto of sorts for modern embroidery, in which she enjoined Weimar-era women to “develop a feeling for abstract forms”. Höch, in other words, was an unlikely addition to the boisterous lineup of Berlin dada, and efforts to edge her out of the frame began almost immediately. Whether because of her conventional training in the applied arts, her involvement in commercial illustration or the mere fact of her being a woman, Grosz and Heartfield took against her work, and tried to exclude it from the fair; she was only reinstated when Hausmann, a key figure in the group, threatened to withdraw. Most of what she exhibited in 1920 has been lost: more photomontages and a few of her trademark“dada dolls”. A photograph of Höch cradling one of these curious figurines shows her sporting an astonishing science-fiction get-up, but she did not relish the exhibitionist element in dada. It is said she was embarrassed by the bohemian antics of her male confederates, though she did appear in a supporting role (armed with a saucepan and a toy gun) in at least one clamorous performance. The montages that Höch made in the years following the fair divide equally between explicitly political comment – more or less in line with communist colleagues such as Heartfield – and a visual celebration of the 1920s New Woman: though the latter leans in turn towards more formal, eventually abstract, experiments. In Heads of State, from 1920, she took a recent newspaper photograph of German president Friedrich Ebert and his defence minister Gustav Noske, pictured in their bathing trunks at a Baltic resort, and set their paunchy figures atop an iron-on embroidery pattern of a woman with a parasol, surrounded by flowers and butterflies. A year later, in Dada-Ernst – which might mean “Dada-Serious”, or may be a reference to fellow collagist Max Ernst – she was juxtaposing sentimental images of 19th-century femininity with photographs of athletic young women whose limbs, freed at last from the constraints of the old century, are equated with the soaring forms of skyscrapers. There are bare legs everywhere in Höch’s art from this point on: flexing and leaping, frequently amputated from any actual body, the motif expresses at once the graphic energy of the New Woman and a kind of surrealist grotesque – the abscised limb with a life of its own. By the end of the 1920s Höch had lost touch with most of the Berlin dada group, though she remained well-connected among the European avant-garde: her friends and occasional collaborators included Tristan Tzara, László Moholy-Nagy and Kurt Schwitters. (Along with Hans Arp, Schwitters, she later recalled, was among the very few male artists she knew who was willing to take a woman seriously as a colleague.) She had split from Hausmann in 1922, and at the end of the decade, having moved to the Netherlands, she began a lesbian relationship with the Dutch writer Til Brugman. For almost 10 years after the dada fair, Höch declined to exhibit her photomontages, preferring to concentrate on painting. But she had not stopped cutting and pasting, and this period produced two of her most compelling and self-contained projects. The first, From an Ethnographic Museum, is a group of 17 works made in the late 1920s, featuring images of non-European sculpture sutured to photographic fragments of human bodies and faces. In the catalogue for the Whitechapel exhibition, the scholar Brett Van Hoesen frets about the artist’s precise attitude to her colonial source materials. Höch had frequented ethnographic museums in Leiden and Berlin, but we cannot say for certain that she developed much of a critical perspective towards relics from Germany‘s lost colonies or the ways they were now exhibited. She seems more interested here in form than politics, experimenting with increasingly grotesque agglomerations of heads and body parts, and setting her inventions against slabs of livid colour. At the same time, she had embarked on a more private project, completed in 1934. Höch’s Album is a scrapbook of a little over 100 pages into which she pasted 421 photographs cut from magazines and newspapers. It is not an exercise in photomontage as such; almost all the images are intact, and the book’s visual intensity is mostly a matter of how they collide and rhyme across double-page spreads. She borrows liberally from fashion photography, movie-star portraits, architectural studies and natural-history close-ups. The legs of dancers and naked gymnasts resemble nests of scaffolding and the spindly forms of Karl Blossfeldt’s plant photographs; dogs and kittens stare soulfully like Hollywood starlets and pompous statesmen. It’s been argued that the Album was a repository for motifs to be employed later in her photomontages, but the effect is actually of a fully achieved work, in which the forms and images of mass media meld and interlace into an exotic whole. Little of Höch’s post-dada work was exhibited at the time. Though her collages were not included in theEntartete Kunst exhibition of 1937, she had been an early victim of the Nazis’ assault on “degenerate art”. An exhibition of her paintings and photomontages was planned at the Bauhaus in Dessau in May 1932, but was cancelled when the Nazi-dominated local council closed the school. Höch had been marked out with many of her dada contemporaries as a “cultural Bolshevik”; in a postwar interview she commented regarding the retrospective evidence of the 1920 fair: “Those few slogans were indeed evidence enough, in the Nazi era, to have us all tried and condemned as communists.” While many avant-gardists now fled Germany, Höch went into internal exile: she bought a house on the outskirts of Berlin, hoping her neighbours would not guess at her past and denounce her, and she lived out the war with her own work and those of several dada exiles hidden away in a cabinet. It’s customary to see in Höch’s postwar art a blithe turn towards an almost decorative abstraction, all vestiges of her radical past fallen away in favour of dizzying arrangements of colour. There is a little truth in this: her palette was now drawn from colour advertisements, and especially from magazines such as Life. But the accusation misses the astonishing complexity of pieces such as her 1967 Industrial Landscape, in which photographs of a crowded swimming pool and the Swiss resort of Lugano are filleted and repurposed to such an extent that they resemble teeming factories and smokestacks. Perhaps only Ernst (whom it seems she never met) achieved quite this level of skill with the scalpel. 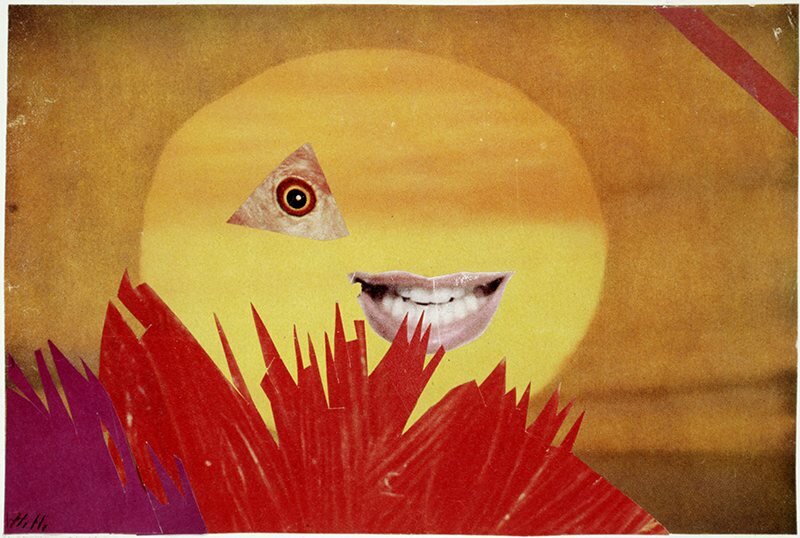 Besides, there are many instances where motifs from her early work – notably fragments of the female body – reappear with new force and meaning: the grinning mouth of Marilyn Monroe, for example, hovering beside a fish’s eye in herLittle Sun of 1969. Höch died in 1978, her place in 20th‑century art history almost, but not quite assured. Postwar histories of dadaism tended to patronise at best; she does not appear at all in Robert Motherwell’s 1951 Dada Painters and Poets, and Hans Richter, in 1965, called her “a good girl” with a “slightly nun-like grace”. But gradually she snuck into the canon – she was part of the major Dada, Surrealism and Their Heritage exhibition at the Museum of Modern Art in 1968 – and scholars and curators have since belatedly recognised that she was both a key dadaist and considerably more: a true pioneer of photomontage and a complex, funny critic of mainstream and art-world misogyny alike. The Whitechapel show reminds us most of all that her innovative presence has survived in the work of later monteurs: in the laconic and unsettling incisions practised by John Stezaker, in the pointed assault on images of women and commodities in the work of Linder Sterling, and more recently in the playful grotesques of the late Polish artist Jan Dziaczkowski. Her keenest insight is to have already seen, almost a century ago, that the profusion of images given us by the mass media might constitute “a new and fantastic field for a creative human being”.